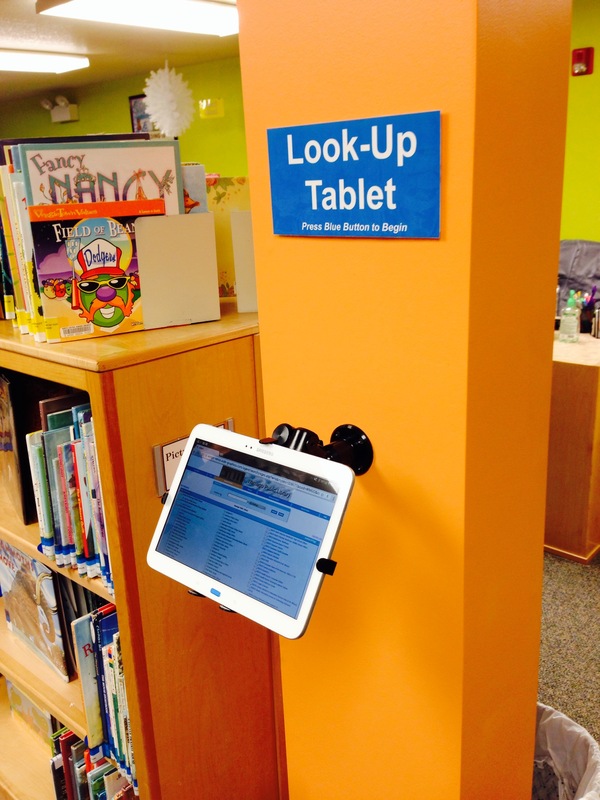 We are very excited about our new Tablet Look-Up Station in the children’s room! It just went up this week, but so far our patrons are liking it. We were fortunate enough to receive an LSTA grant to be able to purchase the tablet and hardware. (This look-up station replaces our old computer look-up.) It’s sleek, takes up less room, and best of all…since it’s a tablet…you can talk to it! Kids who can’t yet spell, or have trouble spelling, can speak to the tablet to search. Hooray for technology! Update: Here’s an update from a month after installing the tablet, and a review of parental controls! February 7, 2014 in Library Design & Displays. We’re thinking of doing this in my library as well! Since it’s been a couple of weeks from when you installed it, has anyone complained about missing the computer station and keyboard/being able to sit down and search, or have patrons readily adapted to using the touch screen to search? The kids certainly have adapted easily (Almost too easily! We’ve had to add some pretty secure parental controls…post coming soon with more info.) Parents are more timid, but staff is making sure to be proactive about demonstrating how it works. Our adult catalog computers are standing computer stations, so I don’t think having this tablet being a standing station has bothered anyone too much. We do have child-size chairs nearby in case someone needs to sit down. And we haven’t had any complaints as far as I know. The kids think it’s awesome! Please tell me how you handle the security of the tablet? I want to put one or two out in my high school library. I am concerned about the tablet getting stolen. Do you know of a mount that would prevent theft of the device? It really all depends on the type of tablet that you have. If you have an ipad, there are many options available for locking mounts, such as this mount from the same company that we purchased our mount from: http://www.thejoyfactory.com/product/mma110 However, since Android tablets come in all shapes and sizes, we were unable to find a true locking mount. Hi! I love your library catalog station! We are planning to try this in our children’s room this fall. Now that you have had the station for over a year I was wondering if you had any additional advice or pointers. How has the equipment held up? Thanks for all your help and your inspiring blog! We love it! The equipment has held up pretty well- we did have a few kids figure out how to take it off the mount so we had to reinforce 🙂 One problem that we are continuing to work on is the parental controls. We had to uninstall the original one (Kids Place/Kids Safe Browser) because when our library system updated it wouldn’t work with the parental blocks. So be sure to experiment with that before purchasing any. Hope this helps!